I have a locket that I’ve worn my entire life. It no longer looks like a locket. It hasn’t looked like a locket in almost 100 years. Only three people not related to me have ever looked at it and known exactly what it is; two of them were jewelers, so they hardly count. The third was a colleague. “You have a teething locket, too!” she exclaimed when she saw it. I do. But I’m not the one who teethed on it. My grandma did. She would have been 99 today. Grandma was the only child of a matriarchal clan. She grew up with her mother and her grandmother (and eventually a stepfather). She graduated from nursing school shortly before the onset of World War II. When the U.S. entered following Pearl Harbor, she was determined to join. Like me, Grandma was barely 5′ tall in her shoes, too short to join the Army. But they were desperate for trained nurses, so they ignored the fact that she was wearing heels and had piled her hair on her head and marked down that she was 5’6″. She met my grandpa in the European theater. He took a job with Ford a few years after the end of the War, which is what brought them to Michigan, where they raised my mom and my uncle. 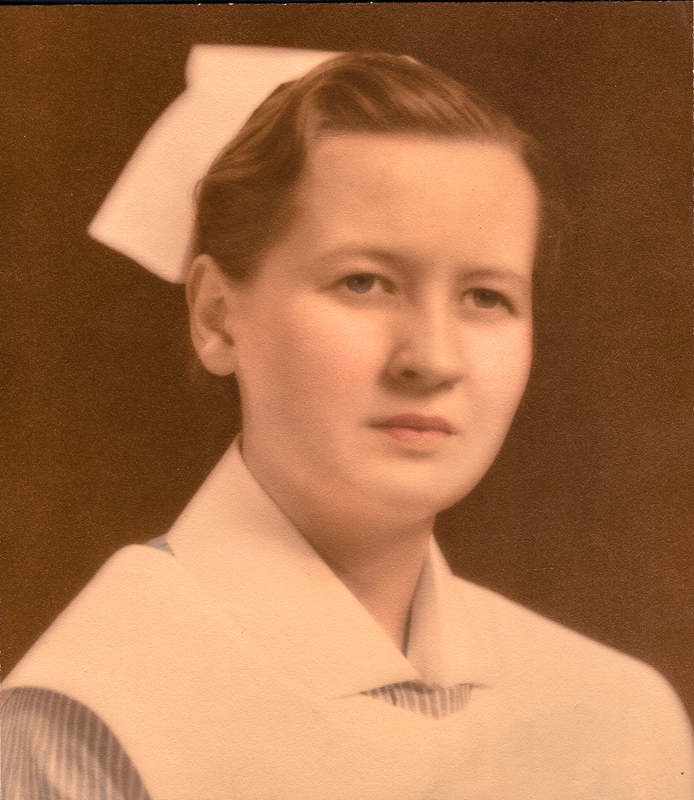 Grandma continued to work; she was a neonatal nurse. I have one uncle on this side of the family. But Grandma and Grandpa had three children. You see, my uncle was a twin. But his brother died. And after Sofia died, I really wished that my grandma was still around. I wish I had known to ask her about the baby who died. What was his name? How long did he live? How long did her grief last? How could I not honor this woman with whom I shared more than I ever imagined possible? P.S. Grandma also had issues with nursing. My mom says she was formula-fed from at least 6 weeks on; she suspects even longer. Go figure. P.P.S. Paula had her baby today, a little boy. Both are doing well. My heart overflows and I wish my Mom had told me her story earlier in my life. I’m sad that she had to hold so much within her. I’m also fortunate to have had such a determined woman as my Mom.